This article provides an overview of TDSP and its main components. We provide a generic description of the process here that can be implemented with a variety of tools. A more detailed description of the project tasks and roles involved in the lifecycle of the process is provided in additional linked topics. Guidance on how to implement the TDSP using a specific set of Microsoft tools and infrastructure that we use to implement the TDSP in our teams is also provided. The Team Data Science Process (TDSP) provides a lifecycle to structure the development of your data science projects. The lifecycle outlines the steps, from start to finish, that projects usually follow when they are executed. If you are using another data science lifecycle, such as CRISP-DM, KDD or your organization’s own custom process, you can still use the task-based TDSP in the context of those development lifecycles. At a high level, these different methodologies have much in common. 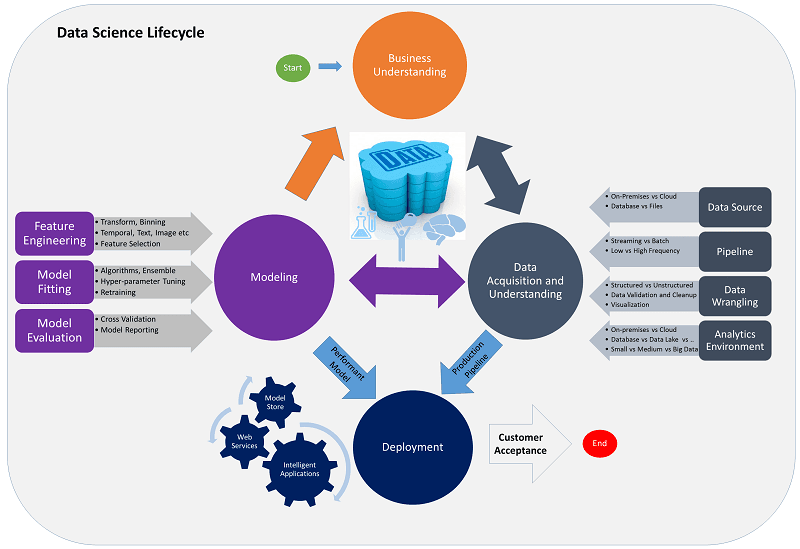 This lifecycle has been designed for data science projects that ship as part of intelligent applications. These applications deploy machine learning or artificial intelligence models for predictive analytics. Exploratory data science projects or ad hoc analytics projects can also benefit from using this process. But in such cases some of the steps described may not be needed. The following diagram provides a grid view of the tasks (in blue) and artifacts (in green) associated with each stage of the lifecycle (on the horizontal axis) for these roles (on the vertical axis). Having all projects share a directory structure and use templates for project documents makes it easy for the team members to find information about their projects. All code and documents are stored in a version control system (VCS) like Git, TFS, or Subversion to enable team collaboration. Tracking tasks and features in an agile project tracking system like Jira, Rally, Visual Studio Team Services allows closer tracking of the code for individual features. Such tracking also enables teams to obtain better cost estimates. TDSP recommends creating a separate repository for each project on the VCS for versioning, information security, and collaboration. The standardized structure for all projects helps build institutional knowledge across the organization. The directory structure can be cloned from Github. The analytics and storage infrastructure can be in the cloud or on-premises. This is where raw and processed datasets are stored. This infrastructure enables reproducible analysis. It also avoids duplication, which can lead to inconsistencies and unnecessary infrastructure costs. Tools are provided to provision the shared resources, track them, and allow each team member to connect to those resources securely. It is also a good practice have project members create a consistent compute environment. Different team members can then replicate and validate experiments. Here is an example of a team working on multiple projects and sharing various cloud analytics infrastructure components. Introducing processes in most organizations is challenging. Tools provided to implement the data science process and lifecycle help lower the barriers to and increase the consistency of their adoption. TDSP provides an initial set of tools and scripts to jump-start adoption of TDSP within a team. It also helps automate some of the common tasks in the data science lifecycle such as data exploration and baseline modeling. There is a well-defined structure provided for individuals to contribute shared tools and utilities into their team’s shared code repository. These resources can then be leveraged by other projects within the team or the organization. TDSP also plans to enable the contributions of tools and utilities to the whole community. The TDSP utilities can be cloned from Github. Team Data Science Process: Roles and tasks Outlines the key personnel roles and their associated tasks for a data science team that standardizes on this process.